Washington, Oregon, California and British Columbia are teaming up to make the I-5 West Coast Green Highway a national model for sustainable transportation infrastructure. In one of the nation’s boldest steps toward a unified alternative-fuel corridor, the partners are working with the private sector and other agencies to lay the groundwork for a smooth and rapid shift to the widespread use of vehicles that run on electricity and other sustainable fuels. Partnerships: building a coalition of public agencies and private businesses that will support and in some cases fund West Coast Green Highway projects. Business Assistance: exploring incentives, funding assistance and marketing for businesses that invest in alternative fuels and infrastructure. Fueling and Charging Sites: identifying locations and funding for alternative fuel infrastructure to ensure travel connections between cities, regions, states, and countries. Branding: creating recognizable way-finder signs and a distinctive west coast travel experience for drivers and businesses that use the corridor. The U.S. Department of Transportation named I-5 a “Corridor of the Future.” It was one of six transportation corridors selected for a program aimed at developing innovative national and regional approaches to reduce congestion and improve the efficiency of freight delivery. Part of the application submitted by Washington, Oregon and California included the development of alternative fuels distribution along the corridor. 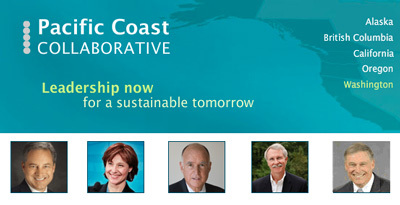 The Pacific Coast Collaborative is committed to supporting and promoting innovation and the adoption of new personal and mass transportation technologies such as hydrogen and fuel cell-powered vehicles, electric vehicles, renewable bio-fuels, and the regional infrastructure to support them. To reduce our region’s greenhouse gas emissions and reliance on foreign oil, the four jurisdictions are working together on clean transportation initiatives. Three west coast state departments of transportation signed a Memorandum of Understanding agreeing to work together to foster the use of alternative fuel vehicles. Washington and British Columbia signed a similar agreement to advance the alternative fuels corridor. Transportation policy leaders in California, Oregon, Washington and Alaska address the challenge of goods movement in the Pacific states through the West Coast Corridor Coalition (WCCC). The public, private and non-profit members of the WCCC closely collaborate on the planning and financing necessary to create a seamless clean, green and smart transportation corridor up and down the west coast. Their common goal is to continue to lead the nation in the development, testing and implementation of ways to reduce our dependence on oil, reduce greenhouse gas emissions, and develop new industries and jobs.